offers a spectacular coast flanked by islands. 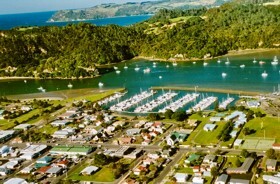 The main town, Whitianga, a thriving town with 4,000 permanent residents offers a full range of visitors services and attractions. Buffalo Beach offers safe swimming, good fishing and shellfish collecting. most fascinating places. For two hours either side of low tide, you can dig in the sand for hot spring water and make your own spa pool. 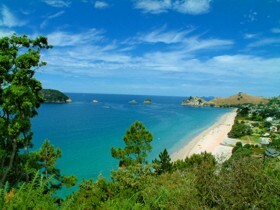 Hahei is famous for his stunning coastline and beautiful beaches. 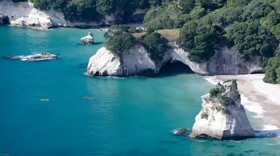 From the lookout there is access to majestic Cathedral Cove and the marine reserve. 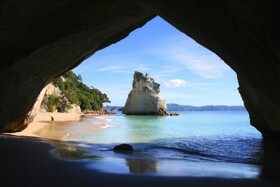 Nature has created a magic place at Cathedral Cove. The beach of sparkling white sand is surrounded by sea or white cliffs covered in bush. At one end of the beach a large cavern passes through a headland and the whole atmosphere is reminiscent of a church. 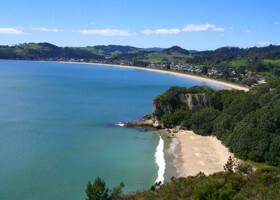 Cooks Beach has safe beach flanked by Shakespeare Cliff to the west and the picnic spot of the Purangi River to the east.